Allen Newell, the U.A. and Helen Whitaker professor of computer science at Carnegie Mellon University (b. San Francisco 1927 - d. Pittsburgh 1992). Newell had an imaginative 42-year career in artificial intelligence and cognitive science. Newell received a bachelor's degree in physics from Stanford in 1949. He attended Princeton for a year in mathematics and then worked for the Rand Corporation from 1950-1961. While at Rand, he met Herbert A. Simon, then a professor of industrial administration at Carnegie Institute of Technology (CIT). 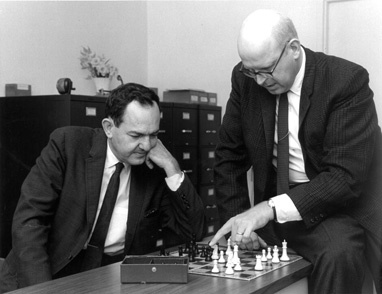 Their discussions on how human thinking could be modeled led Newell to come to Pittsburgh. Newell earned a Ph.D. in industrial administration from CIT in 1957 and joined the CIT faculty as a professor in 1961. He played a pivotal role in creating Carnegie Mellon's Department of Computer Science, as well as elevating it to world-class status. Newell wrote and co-authored more than 250 publications, including 10 books. His final book, Unified Theories of Cognition was based on the thesis that tools are at hand that will allow cognitive scientists to develop one unified theory to describe many different types of behavior, instead of building separate theories to cover isolated aspects, as has long been the practice. A system based on a unified theory could support the full range of intelligent behaviors. Several excellent biographies and tributes have been written about of Allen Newell's life. Each one listed below was authored by people who had been fortunate to work closely with him over the years. Simon, Herbert A. (1997). Allen Newell: A Biographical Memoir. Biographical Memoirs (vol. 71). Washington, DC: The National Academy of Sciences. Laird, John E. and Paul S. Rosenbloom (1992). The Research of Allen Newell. AI Magazine, 13:4, 19-46. Desires and diversions / Allen Newell; Carnegie Mellon University, School of Computer Science. Stanford, CA: University Video Communications, c1993. Newell presents a retrospection of his lifelong pursuit of a single scientific goal: understanding the nature of the human mind. He discusses when a scientific life really starts, how to make diversions and failures useful, and what to do with successes. Draft of an introduction to the Mind Matters Symposium, 5/26/92. Unified Theories of Cognition / Allen Newell. Cambridge, MA: Harvard University Press, 1990. This was Newell's final book, the result of his 1987 William James Lectures at Harvard. This book is considered to be the capstone to his life's work.